Sheinside is, I'm sure, a brand you've all heard of many times by now. They work very closely with bloggers which is where I personally came across them. I have to say, their items are quite similar to other brands, BUT.. are a lot cheaper (hooray!). I won't name names, but there's a brand I worked with recently who's items are similar, other than the price tags which are usually at least double Sheinside's! When it gets to this time of year I am always on the hunt for more coats, jackets and general outerwear (even though I have way too much for my own good anyway haha), and when browsing Sheinside, I fell in love with their outerwear. They have so many interesting, unique designs and are ALL priced amazingly. Below is a little wishlist I created of a few of my favourites. 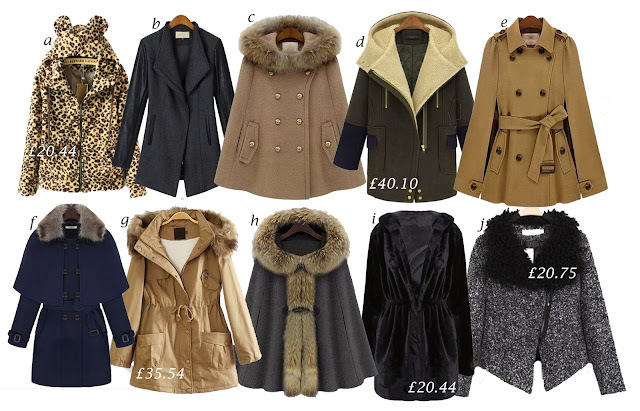 My absolute favourite has to be coat H though! It's a little pricey-er than the others but it's such a beautiful cape and the fur detailing is just AHHH. Which one's your favourite? You can also see a few other mega cheap ones that I love here, here, here, here, here, and here. I love coats D and E - they look so warm and cosy! Some gorgeous coats there - I also like H - how cute is that!! I loveee that last one!